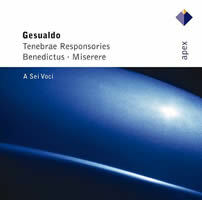 Carlo GESUALDO: Tenebrae Responsories (1611); Benedictus; Miserere. A Sei Voci: Gaël de Kerret, Alain Zaepffel (cantus), Rachid Safir (sextus), Régis Oudot (altus), Philippe Balloy (quintus), Bernard Fabre-Garrus (ten), Bernard Dehont (bassus). Apex 2564 62782-2 (2 CDs) (http://www.warnerclassicsandjazz.com/). Distributed in the US by Warner Classics (http://www.warnerclassicsandjazz.com/). Apex is Warner Classics’ U.K. budget arm; this reissue of a 1987 Erato set that never arrived here (I got mine used) has special claims. Gesualdo’s wrenching chromatic harmonies are apparent enough — everybody cites them. I find his rhythmic disruptions and off-kilter entrances highly upsetting. A Sei Voci sounds a degree more inner-directed than the slicker Hilliard Ensemble (ECM), thus preferable: Gesualdo was writing late in life for his private chapel (i.e., an audience of himself). 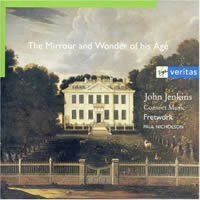 “The Mirrour and Wonder of his Age.” John JENKINS: Consort Music. Fretwork: Wendy Gillespie, Richard Campbell, Richard Boothby, William Hunt, Julia Hodgson, Susanna Pell (viols); Paul Nicholson (org). Virgin Classics Special Import 7243 5 45230 2 (http://www.emiclassics.com/). Distributed in the US by EMI (http://www.emiclassics.com/). Grateful as I am for additions to the Jenkins (1592-1678) catalog, this 1996 CD retains primacy. Fretwork brings viol-playing of lofty refinement — a mid-sized, impeccably tuned sonority with individuals clearly located inside exacting ensemble. The 78:15 program shows Jenkins’ various sides: dance forms, divisions, fantasies, In nomines, Lawes-influenced suites. Every piece is graced by his alluring melodic gift (within contrapuntal argument). Pavan for two bass viols has surprising flow and lift, not limitations. 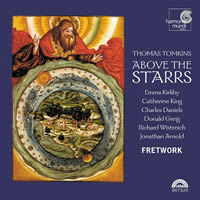 “Above the Starrs.” Thomas TOMKINS: Verse Anthems & Consort Music. Emma Kirkby (sop), Catherine King (alt), Charles Daniels (ten), Donald Greig (bar), Richard Wistreich, Jonathan Arnold (bs); Fretwork: Richard Boothby, Richard Campbell, Wendy Gillespie, Julia Hodgson, William Hunt, Susanna Pell (viols). Harmonia Mundi HMU 907320 (http://www.harmoniamundi.com/). Distributed in the US by Harmonia Mundi (http://www.harmoniamundi.com/). Here Fretwork is cast partly as accompanists. Predictably, the singing seldom rises to the level of the backgrounds — period enunciation lends the six vocalists a scrappy air in choruses. King shines brightest, securing a timbre to complement the glowering viols on “Woe is me” and leading the stirring oddity “Rejoice, rejoice and singe” with flags flying. The consort items naturally receive quality readings. Tomkins (1572-1656) builds on previous models, augmenting them with sufficient turns. 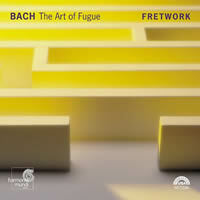 Johann Sebastian BACH: The Art of Fugue, BWV 1080 (1740-45, 1748-50). Fretwork: Richard Boothby, Richard Campbell, Wendy Gillespie, Julia Hodgson, William Hunt, Susanna Pell (viols). Harmonia Mundi HMU 907296 (http://www.harmoniamundi.com/). Distributed in the US by Harmonia Mundi (http://www.harmoniamundi.com/). A finely balanced viol sextet can handle The Art of Fugue with less tugging than a string quartet (Musica Antiqua Köln’s acclaimed chamber version was already halfway there). I’d note Fretwork’s beautifully launched solo subjects and hair-raising slowdowns for landing, the squad remaining in perfect formation. Brisk dispatch of the canons never appears forced, and their unfinished fugue stops when Bach does. The recording at famed The Maltings, Snape abounds in detail and spatial clues. “The Magic of Lang Lang.” Franz LISZT: Hungarian Rhapsodies, S. 244: No. 2 (1847; Horowitz arr. ); Liebesträume, S. 541: No. 3 (1850). Peter Ilyich TCHAIKOVSKY: Piano Concerto No. 1, Op. 23: 3rd movement (1874-75). Lu WENCHENG: Autumn Moon on a Calm Lake (1975). Robert SCHUMANN: Kinderszenen, Op. 15: Träumerei (1838). Frédéric CHOPIN: Nocturnes, Op. 27: No. 2 (1835); Piano Sonata No. 3, Op. 58: 4th movement (1844). Wolfgang Amadeus MOZART: Piano Sonata No. 10, K. 330: 1st movement (1781-83). Sergei RACHMANINOV: Piano Concerto No. 2, Op. 18: 2nd movement (1900-01); Rhapsody on a Theme of Paganini, Op. 43: Variation 18 (1934). Franz Joseph HAYDN: Piano Sonata No. 60, H. 16 No. 50: 3rd movement (1794-95). Xinghai XIAN: The Yellow River : Song of the Yellow River Boatmen (1940; 1970 arr.). David FOSTER: Io ci sarò*. 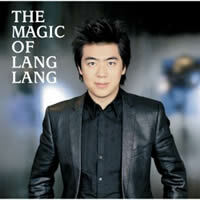 Lang Lang (pno); Andrea Bocelli* (ten). Deutsche Grammophon B001077402 (http://www.deutschegrammophon.com/).